Did you know that the last Gallic warriors massacred by the Romans lie beneath the Eiffel Tower? That the remains of Paris’s first cathedral are under a parking lot in the Fifth District? Metronome follows Loránt Deutsch, historian and lifelong Francophile, as he goes on a compelling journey through the ages, treating readers to Paris as they've never seen it before. Using twenty-one stops of the metro system as focal points—one per century—Deutsch shows, from the underground up, the unique, often violent, and always striking events that shaped one of the world’s most romanticized city. Readers will find out which streets are hiding incredible historical treasures in plain sight; peer into forgotten nooks and crannies of the City of Lights and learn what used to be there; and discover that, however deeply buried, something always remains. <p>A comedian and bestselling author in France, LORANT DEUTSCH has always had a passion for history and his native Paris. 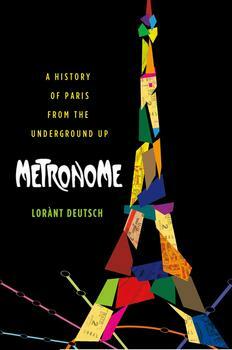 A phenomenal bestseller in France, Metronome presents a fascinating history of Paris through the lens of the city's iconic Metro system.